Susan Davitti Darling is the next artist in our Meet Our Members interview series. Susan lives in Maytown PA and is employed by Elizabethtown College. 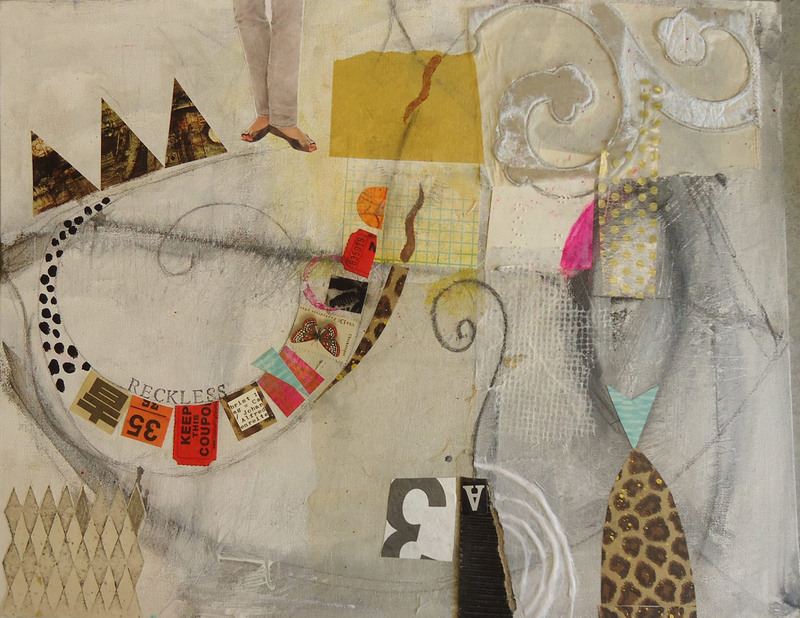 She is an avid watercolor, mixed media and collage artist. 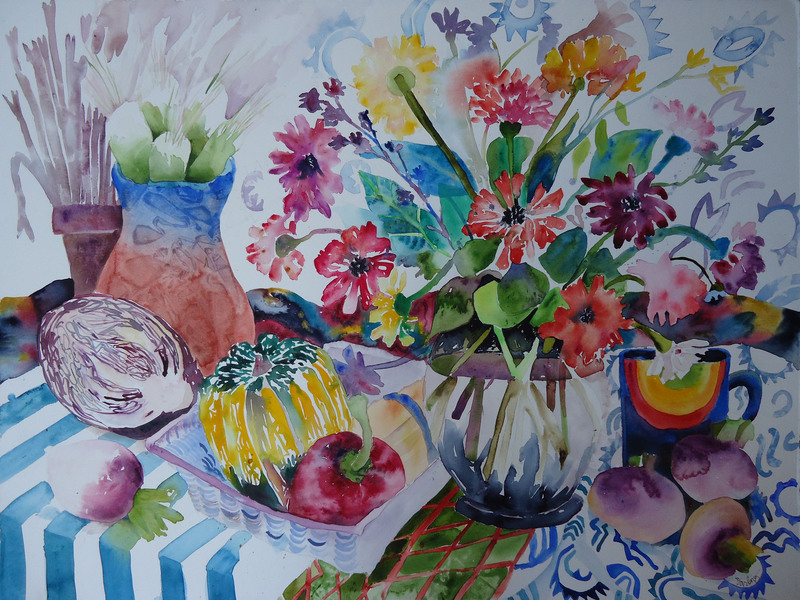 We always enjoy Susan’s fun, bright, whimsical and extraordinary art work! What initially sparked your interest in ART? Millersville University. I feel very fortunate that I had that opportunity. work and how they look. particular day, I still work. To Quote Hank Aaron, “Always keep swinging. only thing to do is keep swinging.” Art keeps me going. It makes me happy. As an artist we have many roles; which do you find to be the most rewarding and which the most challenging for you? creative nature and it is good to access that. line work speak for me. work, whether it is subdued or vibrant. It speaks volumes. What dream supply would you purchase if money were no issue? like a place to store large paper and finished unframed artwork. What message do you want to convey to the viewer through your work? people can feel the joy that is inherent in the creation. You can always find a big mess in my studio along with works in progress! There is always MUSIC playing. My cat hangs out there with me. and this art is testimony to that. Susan Davitti Darling will be participating in a 2 person exhibit at Lynden Gallery, 117 South Market Street, Elizabethtown, PA 717-367-9236. The exhibit opens in July and runs thru September, 2014. There will be an opening reception at the gallery on July 11th from 6pm – 9:00pm. 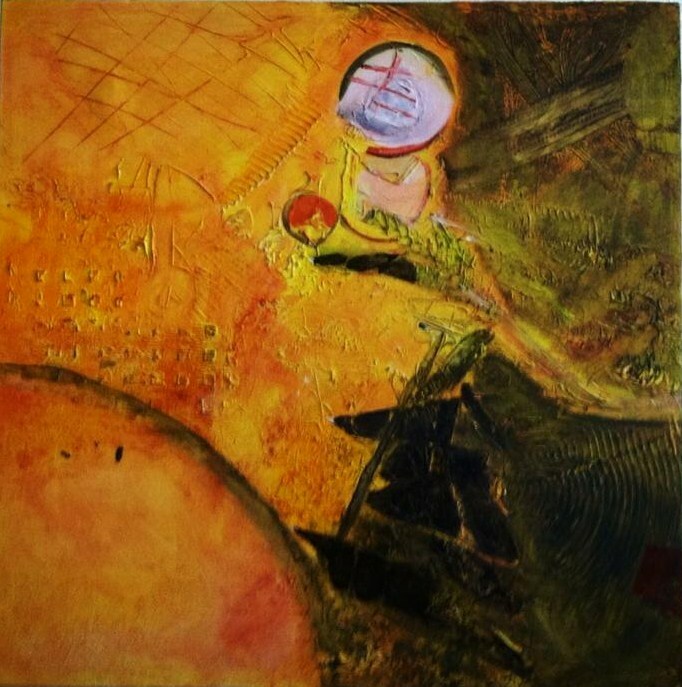 You can view more of Susan’s work on the Mixed Media Art Group website. This entry was posted in Exhibits, Meet Our Members, Susan Davitti Darling and tagged abstract, abstract art, acrylic, art, art exhibits, arts, collage, Elizabethtown PA, Lynden Gallery, mixed media, Pennsylvania, Pennsylvania artists, Susan Darling, Susan Davitti Darling on May 19, 2014 by mixedmediaartgroup. The members of Mixed Media Art Group would like to wish everyone a very Merry Christmas and a Happy New Year!!! And we want to thank you for a great year!!! Thanks for taking the time to view our work on this blog, on our website and on our Facebook page throughout 2013. You, our followers, have shown so much enthusiasm for what we have been working on and we appreciate your interest! We look forward to bringing you lots of new and fabulous art in 2014!!! Here are some candid photos taken during our recent reception at Arts on Union. The photos really show the fun nature of this group!!! There are 18 of us, and although some are missing from the photos, we are all united in the spirit of creativity within this group. There is still time to see our current exhibit at Arts on Union, 203 N Union St, Middletown, PA. Visit us Saturdays and Sundays NOW through January 2014. Small paintings, cards, prints, wine glasses and other art objects from our artists will be available for purchase. The gallery is open Saturdays and Sundays through the end of January. Saturday hours are 11 a.m. to 4 p.m, Sundays,noon to 4 p.m. Contact us if you need a special time or private showing. This entry was posted in Exhibits and tagged abstract, abstract art, acrylic, Ann Lawson, Ann Yeager Lawson, art, art classes, art exhibits, art workshops, arts, assemblage and digital art, basics of digital photography, Bob McCloskey, Christine Gold beck, Christine Goldbeck, cold wax, collage, Doug Tomlinson, Elaine Brady Smith, encaustic, Harrisburg PA, Joan Maguire, Joanne Finkle, Judy Kelly, Linda Benton McCloskey, Lynn Kennedy, Lynn Kennedy Putt, Mary Kandray Gelenser, mixed media, Mixed Media Art Group, oil, Pennsylvania, Pennsylvania artists, photography, Rick Snizik, Sue Blosser, Susan Darling, Susan Davitt Darling, Tami Bitner, Thom Kulp, Tina Berrier, watercolor, workshops on December 12, 2013 by mixedmediaartgroup. Arts on Union will exhibit work by the Mixed Media Art Group, Saturday, Dec. 7 through Jan. 26 at the gallery and studio, 203 North Union St, Middletown, PA. The public is invited to a free reception with the artists on Saturday, Dec. 7 from 5 to 9 p.m. Gallery hours are Saturdays from 11 am to 4 pm and Sundays from noon to 4 pm. 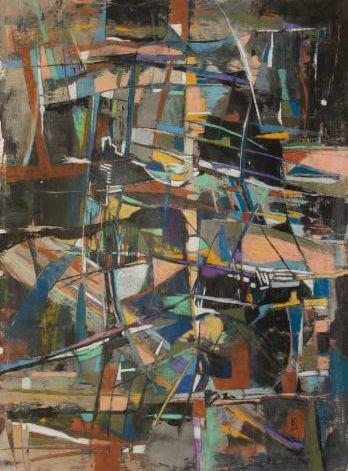 Painters, photographers and assemblage artists from Central Pennsylvania comprise the MMAG. 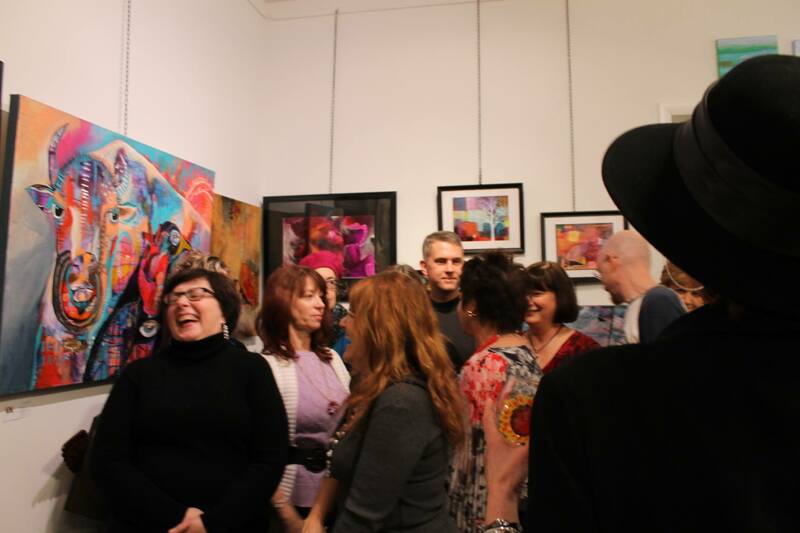 The group exhibits and sells its art locally, nationally and internationally. 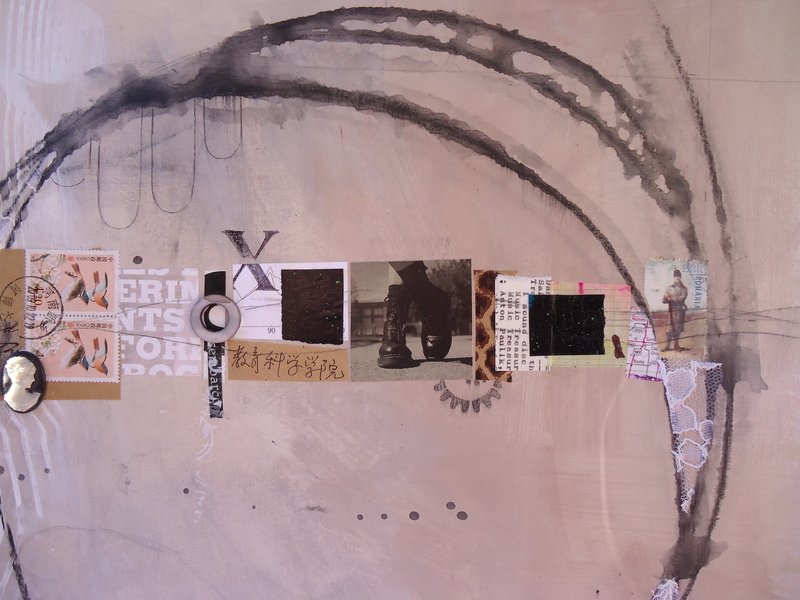 Media include encaustic, collage, mixed media, acrylic, watercolor, oil, cold wax, photography, assemblage, and digital. Styles range from traditional to contemporary and exploratory. Large and small works at affordable price points will be available throughout the exhibition. 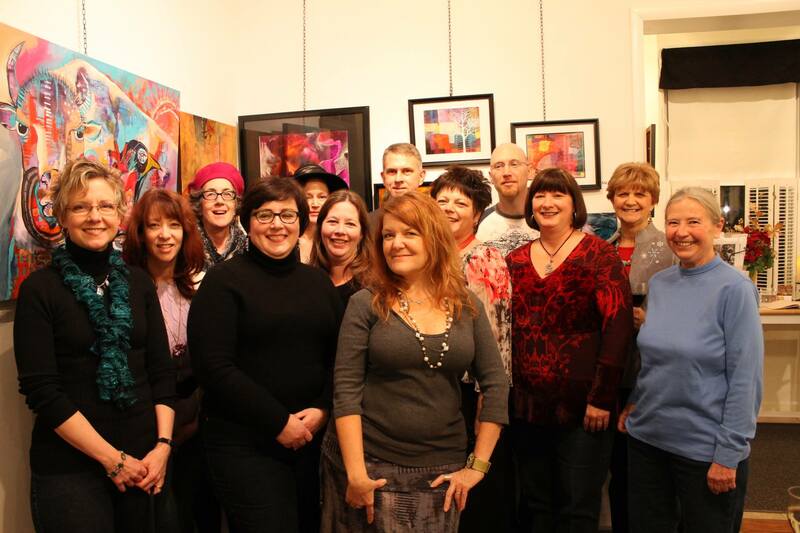 For more information about the gallery and the artists, please visit Arts on Union and Mixed Media Art Group. This entry was posted in Exhibits and tagged abstract, abstract art, acrylic, Ann Lawson, Ann Yeager Lawson, art, art exhibits, arts, Arts on Union, assemblage and digital art, Bob McCloskey, Catherine Stone, Christine Gold beck, cold wax, collage, Doug Tomlinson, Elaine Brady Smith, encaustic, Harrisburg PA, Joan Maguire, Joanne Finkle, Judy Kelly, Linda Benton McCloskey, Lynn Kennedy, Mary Kandray Gelenser, mixed media, oil, Pennsylvania, Pennsylvania artists, photography, Rick Snizik, Sue Blosser, Susan Darling, Tami Bitner, Thom Kulp, Tina Berrier, watercolor on November 12, 2013 by mixedmediaartgroup. Susan Davitti Darling will be showing her art in a group exhibit at York Arts@City Arts, 118 West Philadelphia Street, York, PA 17401. 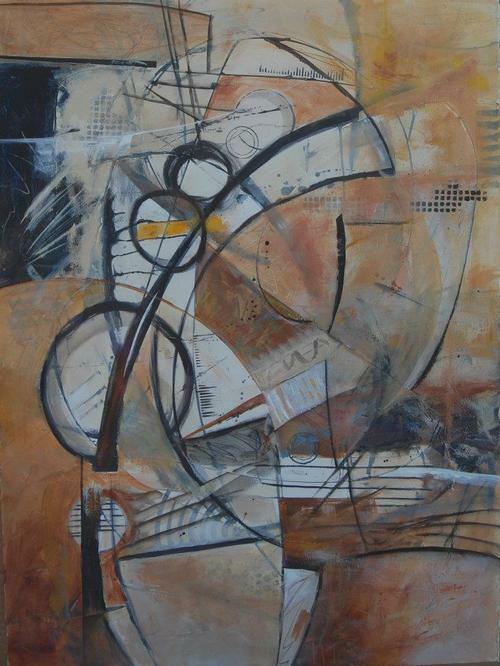 The exhibit opens with an artist reception on Nov 1, 5pm-9pm, and runs through Nov 30th. Gallery hours are Tuesdays, Thursdays and Saturdays 10am-4pm. This entry was posted in Exhibits, Susan Davitti Darling and tagged abstract, abstract art, acrylic, art exhibits, arts, City Arts, collage, mixed media, Pennsylvania, Pennsylvania artists, Susan Darling, Susan Davitti Darling, York, York Arts, York PA on October 16, 2013 by mixedmediaartgroup. 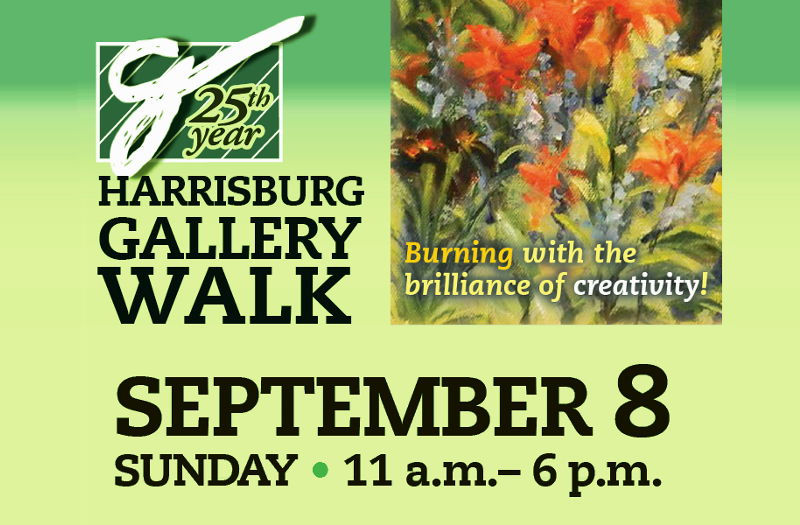 Mixed Media Art Group will be exhibiting during Harrisburg’s 25th Annual Gallery Walk at Pine Street Presbyterian Church, 310 N Third Street, Harrisburg, PA on Sunday, September 8, 11am-6pm. Members Tami Bitner, Joan Maguire, Christine Goldbeck and Bob McCloskey will be demonstrating their painting skills outside and you can visit with other members and view some outstanding artwork inside! 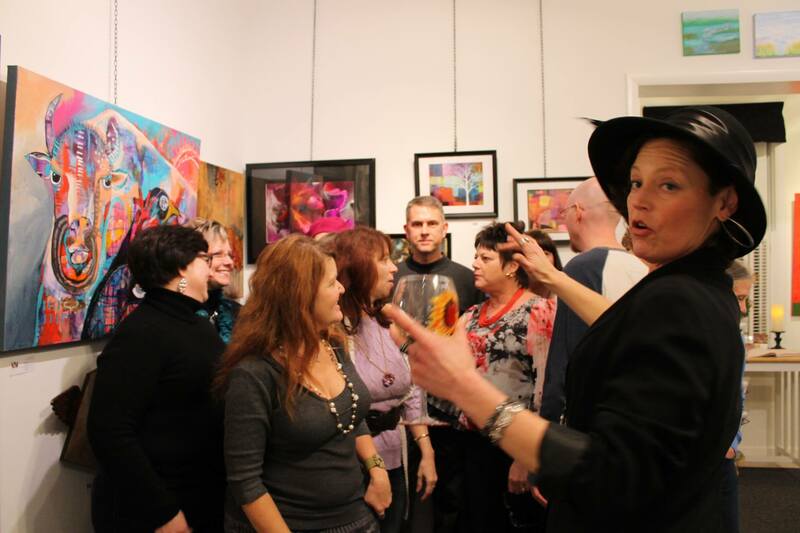 It’s a guaranteed great stop on the tour of Harrisburg’s finest galleries!!! For more information view the Art Association of Harrisburg website where there is a printable pdf map, which includes all the locations on Gallery Walk. And don’t forget that many of our M & M members will also have art on display at the Art Association of Harrisburg for the Annual Membership Show, with “Literary Allusions” theme. We look forward to seeing you at both locations!!! 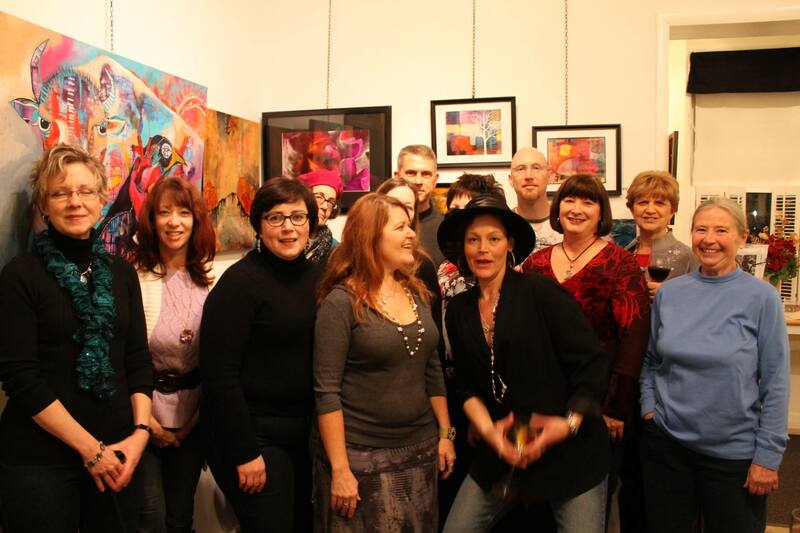 You can find more information about our members at www.mixedmediaartgroup.com. This entry was posted in Exhibits and tagged abstract, abstract art, acrylic, Ann Lawson, Ann Yeager Lawson, art, Art Association of Harrisburg, art exhibits, arts, assemblage and digital art, Bob McCloskey, Christine Gold beck, cold wax, collage, Doug Tomlinson, Elaine Brady Smith, encaustic, Gallery Walk, Harrisburg PA, Joan Maguire, Joanne Finkle, Judy Kelly, Linda Benton McCloskey, Lynn Kennedy, Mary Kandray Gelenser, mixed media, oil, Pennsylvania, Pennsylvania artists, photography, Rick Snizik, Sue Blosser, Susan Darling, Tami Bitner, Thom Kulp, Tina Berrier, watercolor on September 2, 2013 by mixedmediaartgroup. 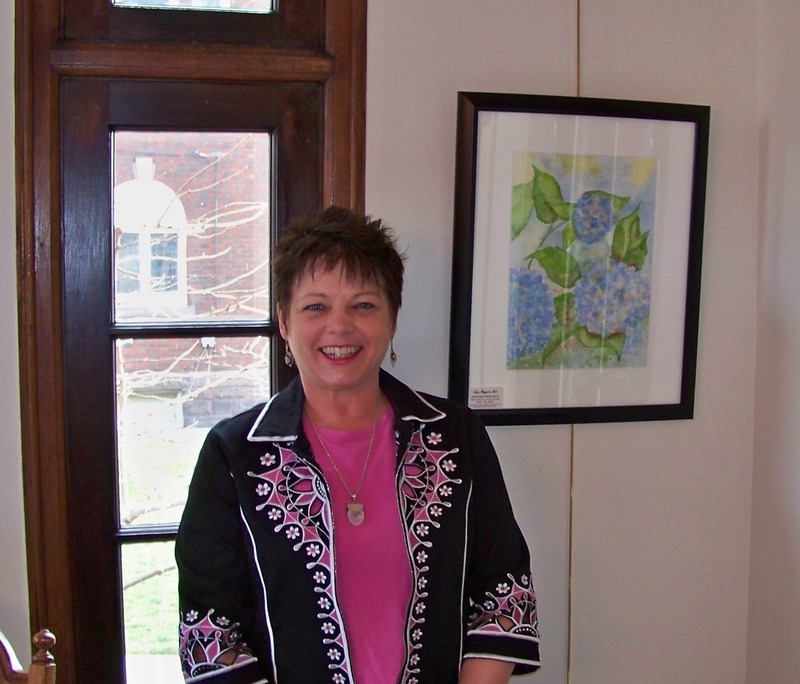 Ann Yeager Lawson has art displayed at WLAN, “We Love Art Now” Gallery, 252 North Queen Street, Lancaster PA. Her piece shown left, is part of the exhibit which will run through April 28th. Thom Kulp and Robert McCloskey are participating in the York Art Associations Spring Members Exhibit, 220 S Marshall St York, PA. The show will be on display through May 18th. Tina Berrier with her 3rd place winner!!! 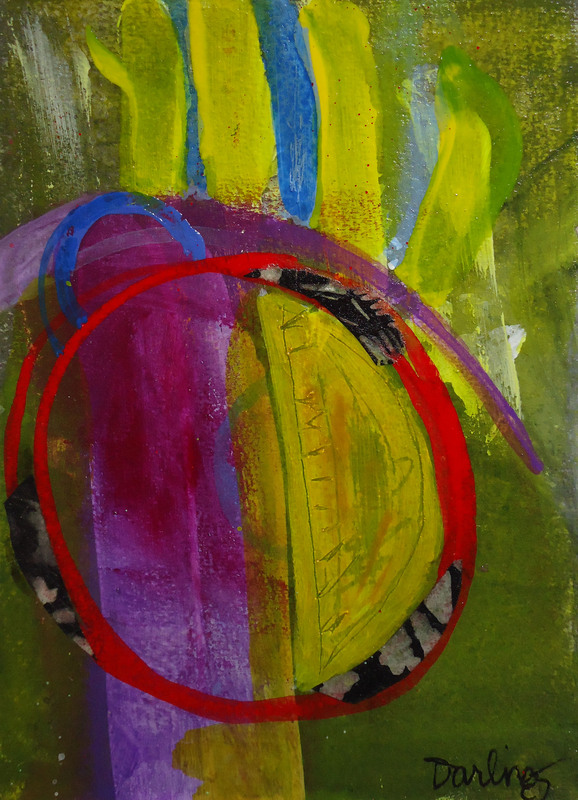 Tina Berrier and Judy Kelly have been accepted to the Mechanicsburg Art Center Juried Show, 18 Artcraft Dr, Mechanicsburg, PA, which opened this past Friday, April 12th. Tina won a 3rd place award for one of her entries to the show which will be on display until May 3rd. Joan Maquire will be the featured artist in Third in the Burg at City House Bed & Breakfast, 915 N Front St Harrisburg, PA on April 19, 6-9pm. 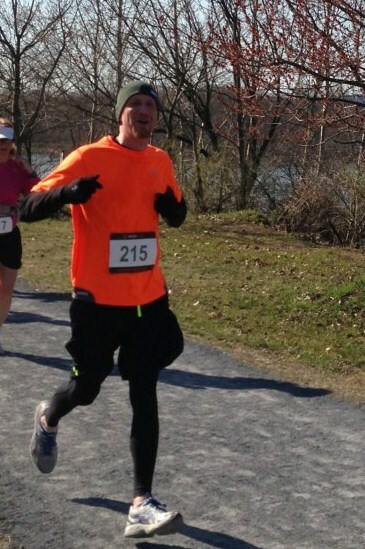 Doug Tomlinson and Susan Darling recently participated in the The CAPITAL 10-MILER in Harrisburg, PA, a run/walk event that benefits many arts organizations of the capital region. Doug ran the 10 miles, while Susan walked it! Way to go! Support the Arts!!! 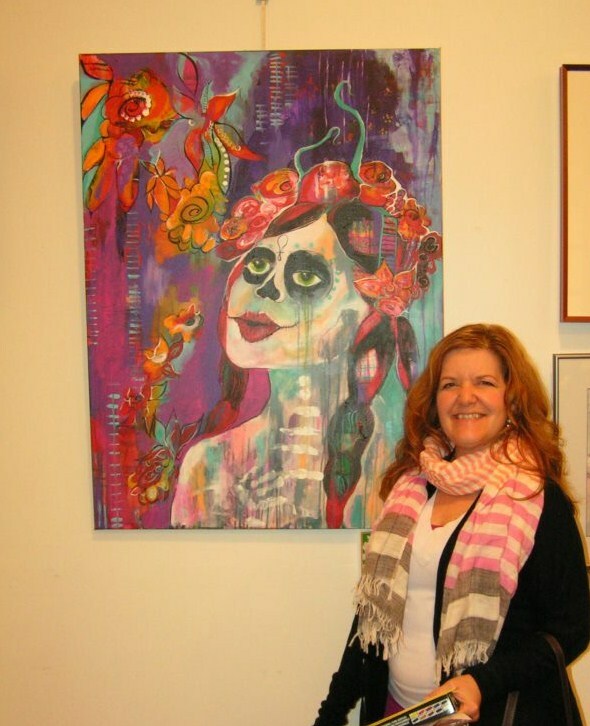 Tami Bitner was the featured artist in Harrisburg Magazine for the month of April. You can read Tami’s article online here. 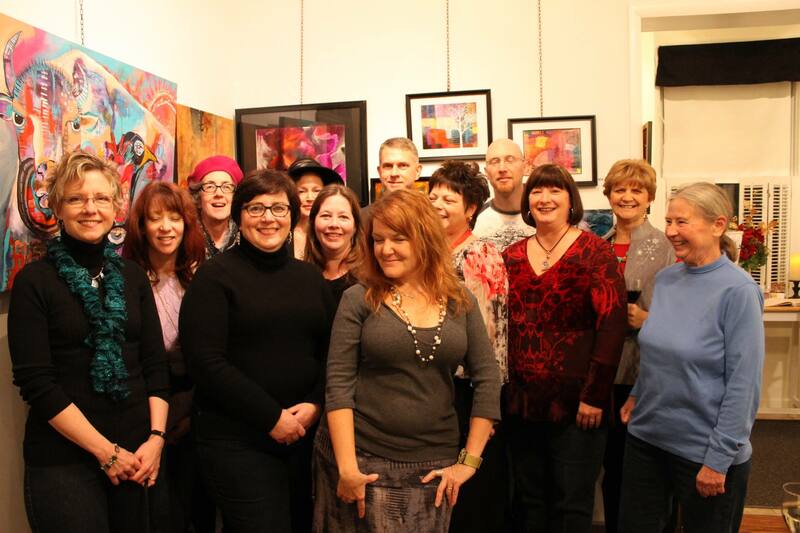 We are proud of the accomplishments of our artist members of M & M Mixed Media Art Group!!! 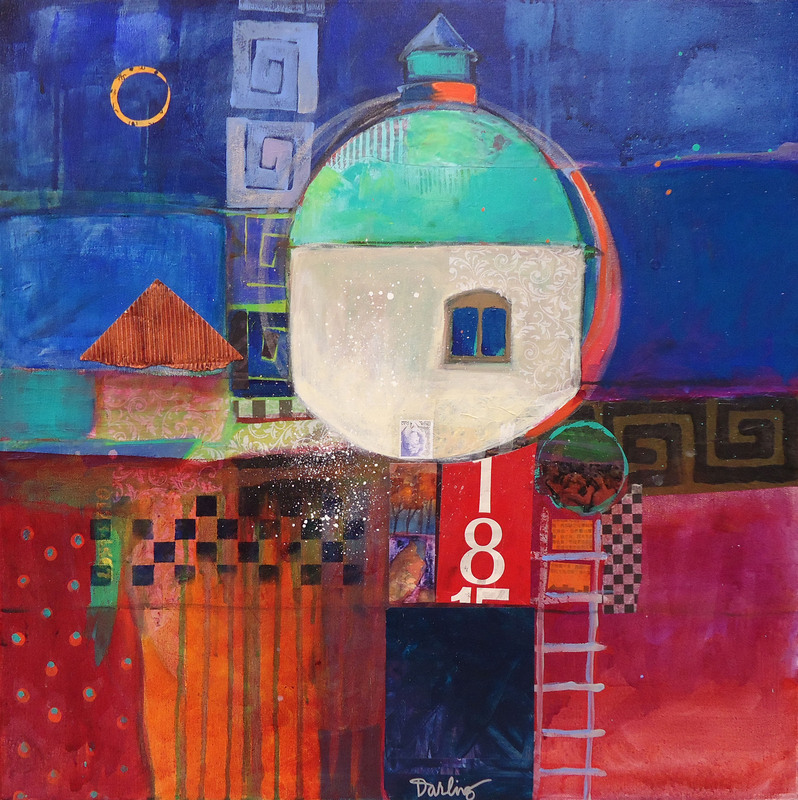 Read more about our members on the Mixed Media Art Group website. This entry was posted in Ann Yeager Lawson, Bob McCloskey, Doug Tomlinson, Exhibits, Joan Maguire, Judy Kelly, Susan Davitti Darling, Tami Bitner, Thom Kulp, Tina Berrier and tagged abstract, abstract art, acrylic, Art Association of Harrisburg, art exhibits, arts, assemblage and digital art, cold wax, collage, Doug Tomlinson, encaustic, Harrisburg PA, Joan Maguire, Judy Kelly, Mechanicsburg Art Center, mixed media, painting, Pennsylvania, Pennsylvania artists, photography, Susan Darling, Tami Bitner, Thom Kulp, Tina Berrier, watercolor, York Art Association on April 18, 2013 by mixedmediaartgroup. 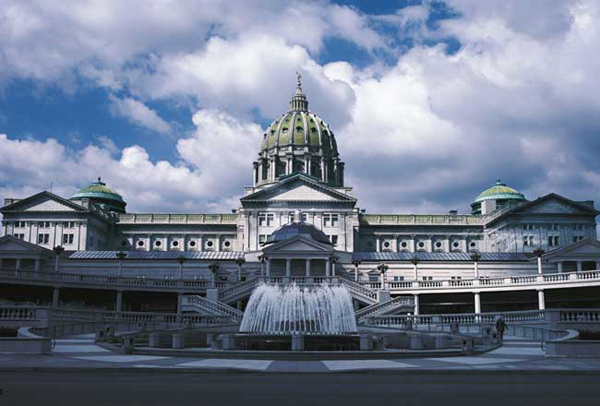 The M & M Mixed Media Art Group recently installed an exhibit of member’s paintings and photography in the East Wing Rotunda of the Pennsylvania State Capitol building in Harrisburg, PA. The exhibit will hang through the end of March and includes the following artists and photographers: Ann Lawson, Doug Tomlinson, Linda Benton McCloskey, Bob McCloskey, Susan Darling, Tina Berrier, Lynn Kennedy-Putt, Mary Kandray Gelenser, Sue Blosser, Catherine Stone, Judy Kelly, Elaine Brady Smith, Joanne Finkle, Rick Snizik, Joan Maguire, and Christine Goldbeck. Ann Lawson and Christine Goldbeck. The central lobby of the East Wing of the Capitol is open to the public Monday through Friday 7:00 AM to 6:00 PM. This entry was posted in Ann Yeager Lawson, Bob McCloskey, Catherine Stone, Christine Goldbeck, Doug Tomlinson, Elaine Brady Smith, Exhibits, Joan Maguire, Joanne Finkle, Linda Benton McCloskey, Lynn Kennedy-Putt, Mary Kandray Gelenser, Rick Snizik, Sue Blosser, Susan Davitti Darling, Tina Berrier and tagged abstract, abstract art, acrylic, Ann Lawson, art, art classes, art exhibits, art workshops, arts, basics of digital photography, Bob McCloskey, Catherine Stone, Christine Gold beck, collage, Doug Tomlinson, Elaine Brady Smith, encaustic, Harrisburg PA, Joan Maguire, Joanne Finkle, Judy Kelly, Linda Benton McCloskey, Lynn Kennedy, Mary Kandray Gelenser, mixed media, oil, Pennsylvania, Pennsylvania artists, photography, Rick Snizik, Sue Blosser, Susan Darling, Tina Berrier, watercolor, workshops on March 3, 2013 by mixedmediaartgroup.